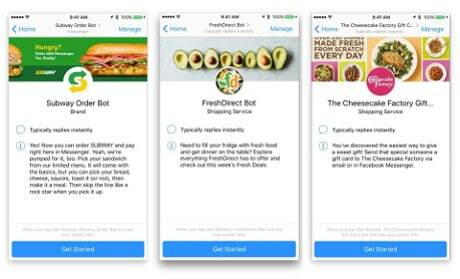 Subway, FreshDirect and The Cheesecake Factory have begun rolling out payment bots for Facebook Messenger across the US, allowing their customers to secure and complete payments using Mastercard’s Masterpass digital payment platform without having to leave the instant messaging service. The retailers are the first to deploy Masterpass-enabled bots for Messenger which use artificial intelligence to enable consumers to interact with retailers, place orders and complete payments. The bots also support “all Masterpass-enabled wallets from banks including Citi and Capital One”, according to Mastercard. “Masterpass-enabled bots have a wide variety of applications — from restaurants to retail — making conversational commerce frictionless, while delivering a more personalised experience,” the payment network says. “Building automated and AI-driven capabilities like bots to conduct commerce will make it easier than ever to interact with people in new, engaging ways,” says vice president of Facebook Messenger David Marcus. Facebook updated its Messenger bots to enable payments in September 2016. Mastercard unveiled plans to launch artificial intelligence bots for banks and merchants in October last year.